It is one of the most anticipated events in Chesterfield, and Saturday proved to be another successful day as Chesterfield held it's 12th annual 'Day of Dance'. 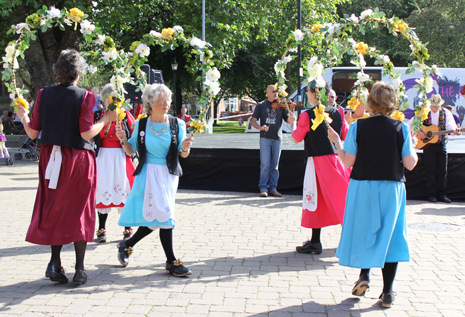 This year, the event was held in Rykneld Square, rather than the more familiar setting of New Square, and a huge crowd gathered in front of the iconic Spire to watch 15 local dance troups and groups go through their paces in celebration of their creative styles. Dancers, including cheerleaders, Morris, Flamenco and Burlesque dancers all showcased their talents, along with Salsa and Zumba groups. The list also included Appalachian dancing and the more familiar Tango. 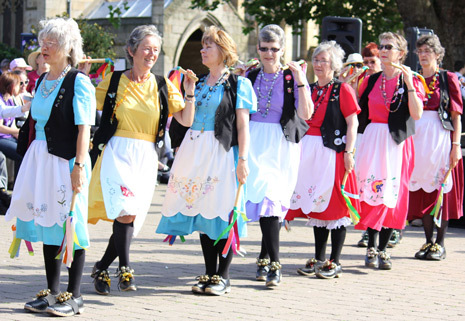 Sean Carrington, Tourism Officer for Chesterfield and one of the team behind the day, said he had been delighted with the response of the people in town to the day, "It's the twelfth Day of Dance, and this year we've moved into Rykneld Square due to the Market Hall renovations. "Today is all about showing local talent and local dance groups and we've even put a bit of fitness into this year's event to encourage people to go out and try to make lifestyle changes. "It's a timely theme on the back of the Olympics this year - along with the old favourites. This year we're also having Zumba and Burlesque." He added "It's all about celebrating Chesterfield, with the well dressings and the Day of Dance - we're encouraging people to come into the town, enjoy it, remember Chesterfield and come back!" Standing in front of the Crooked Spire, Sean added, "We are in the best location we have in Chesterfield and great weather as well!"